There are lots of new figures back in stock at Hasbro Toy Shop! Hurry before they’re gone! Special thanks to JTA reader Craig F. for the alert! ← Kessel Run Millennium Falcon, Not The Kessel Run Han Solo Blaster, Please! Hasbro Toy Shop has an all-new promo code which will give you 20% off in-stock items. You’ll also get FREE shipping with order $14.99 and above. Use code ALLNEW for the discount. Rather bewilderingly, the Doctor Aphra SDCC set is still in-stock online. If you still haven’t picked up this set, I personally recommend it – especially for the amazing droids (don’t see too many of them around anymore). Check out our review of the set here! ← Hurry! Save 15% Off Any Purchase On eBay Ends In A Couple Of Hours! If you’re interested, Hasbro Toy Shop has added new Force Link 2.0 figures as well as the latest The Black Series [Phase III] 6″ figures. Special thansk to Ed in NY for the alert! Hurry! Hasbro Toy Shop Has New Force Link 2.0 Figures IN STOCK! Hasbro has the Rey (Jedi Training) and Darth Vader Force Link 2.0 figures IN STOCK. As you know, the Darth Vader is a pretty sweet figure. *You can check out our reviews on this wave HERE.) Special thanks to JTA reader Rum Sleg for the alert. ← EE's Deal Of The Day: TBS6 [P3] Jaina Solo Case Assortment: $50! HURRY! All Hasbro's SDCC Exclusives Are IN STOCK! Hasbro Toy Shop has restocked all of their SDCC exclusives. Get them before they’re gone! Good luck to all! Thanks to all who wrote in to let us know! Hasbro Toy Shop has the 6″ Rebel Fleet Trooper in stock if you are still looking for this one. Thanks to JTA reader Agustín for the alert! Although not in stock at the moment, Hasbro added product placeholder pages for the Rey (Jedi Training) and Darth Vader Force Link 2.0 figures. The other two figure have yet to be added. As you know, the Darth Vader is a pretty sweet figure. *YOu can check out our reviews on this wave HERE.) Special thanks to JTA reader Agustin for the alert. We are getting some great positive reports of collectors’ Hasbro Toy Shop SDCC orders arriving. We also are receiving some negative ones. JTA reader Tyler receive his box and the Kylo Ren/Rey Centerpiece set was significantly damaged. Click through to read his report! ← Walmart Updates Site, Adds New Products; Could The Exclusives Be Next? SDCC Exclusives From Hasbro Toy Shop Shipping! In case you haven’t heard (or haven’t checked your inbox yet), the SDCC exclusives are shipping from Hasbro Toy Shop. If you haven’t received your shipping notice yet, there is a strong chance your order didn’t go through to completion. We’d recommend calling customer service to check the status of your order. Good luck to all and we hope your items arrive undamaged! Don't Forget - Today SDCC Exclusives Go Up At Hasbro Toy Shop! Hasbro Toy Shop added all three SDCC exclusive products pages to their site on June 18th revealing an August 13th availability date. Let’s see if that pans out today! Good luck to all! UPDATE: Aphra set is OUT OF STOCK! ← HURRY! Order TBS [P3] 3.75" Elite Praetorian Guard Singles For $12.99! The beautiful Ahsoka Tano from the Forces Of Destiny line is IN STOCK at Hasbro Toy Shop. See if you can still use promo code HANSOLO for 15% off and FREE shipping! Special thanks to JTA reader Mark for the alert! ← Yakety Yak, I'm Talking Back, Hasbro! There’s a new Hasbro Toy Shop promo code in town for Solo: A Star Wars Story. Get 15% off AND FREE shippinh by using HANSOLO at checkout! ← HURRY! Moloch and Princess Leia Organa [Hoth] Force Link 2.0 Pre-order! Wampa/Luke Skywalker (Hoth) Force Link 2.0 Set Available To Order Too! The Wampa/LukeSkywalker (Hoth) set is ALSO in stock at Hasbro Toy Shop. You know you want it! Special thanks to Mark for the alert! ← The Black Series Mimban Stormtrooper Sneak Peek! Hurry! Princess Leia (Hoth) Force Link 2.0 Back In Stock! Hurry! Princess Leia (Hoth) Force Link 2.0 figure is BACK IN STOCK at Hasbro Toy Shop! Also, if you still need him, the Rebel Soldier (Hoth) figure from The Vintage Collection is still in stock too! ← Swear Wars: "Curse" Like Your Favorite Star Wars Characters! Hasbro Toy Shop: May The 4th Promo Code! Hasbro Toy Shop is celebrating May The 4th! Use promo code MAY4TH for 20% off and FREE shipping! IN STOCK! The Vintage Collection Rebel Trooper (Hoth) At HTS! The Vintage Collection Rebel Trooper (Hoth) is IN STOCK at Hasbro Toy Shop. Use promo code SPRING2018 to save money! Thanks to all who wrote in to let us know! Hasbro Toy Shop Has TBS6 Qi'ra IN STOCK (Pre-order)! Hurry! The Black Series [Phase III] Qi’ra is available to pre-order at Hasbro Toy Shop with a ship date of 6/1! Thanks to all who notified us! ← SH Figuarts Chewbacca And Mimban Stormtrooper Revealed! Hasbro Toy Shop has added a bunch of new Solo: A Star Wars Story products. Check them out! HASCON Captain Rex Still Showing Up At HTS? 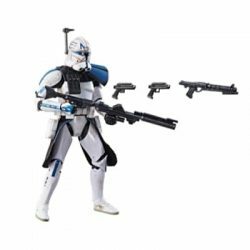 It’s been over a month since HASCON Captain Rex made his live appearance at HasbroToyShop.com, and he has made a few scattered appearances since then. However, the past few nights, at 4:25 am EST EXACTLY, he has come in stock. It’s real, it’s not fake. He has been ordered and has been shipped. Where is this stock coming from? I don’t know, but it seems a little late for returns and cancellations. It’s just sold out again now, but I wanted to make those aware that it could very well come in stock again tomorrow morning. Good luck to those still searching!